The GOLD mattress is made of high performance materials. It's topped with 3 layers of Pillow Top. These layers consist of: Visco Elastic Memory Foam, Euro Latex, and 5 Zoned 3D foam. All material are renowned for soothing relief of pressure points. This is why the preferred mattress for anyone is able to both identify and appreciate the very best. 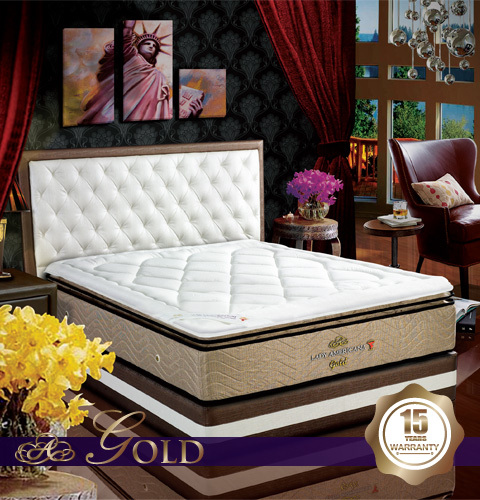 The GOLD offers a unique level of comfort, unmatched by any other mattress. Created with devotion to quality, the unique properties of this luxury lift offer a classically lavish, supremely comfortable sleeping surface fit for royalty.